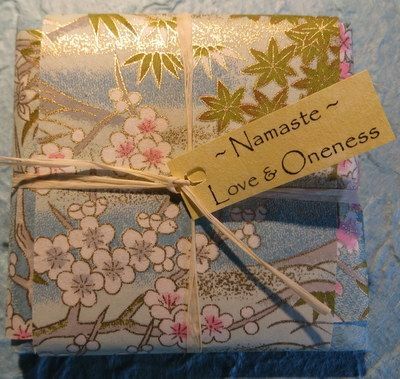 Namaste Love & Oneness Blessing Bundles are sweetly wrapped with handmade and Japanese papers around a tissue paper package containing a collection of 10 magical slips of paper with quotes, affirmations, prayers, a poem, and the meaning of Namaste, as well as a sweet compassionate Buddha talisman, a rose quartz heart, and a paper flower. These colorful packages are 2 1/2 inch square. A heart opening gift! Note from Ingrid: I received this note the other day, and it made my heart sing. "The new creation you sent me from your product line was so fun to open and experience. I felt whooshes of Divine Love come in as I did. I felt very loved and embraced by the Beloved. Such a beautiful idea. You are one clever woman! Where do you get all these ideas? Oh, I know. God! :-) Really, this one is brilliant and such fun, layer upon layer of goodness pouring out. Thank you!" Ideas for new gifts come to me all the time- sometimes I think there must be an angel whispering in my ear. Often I'll combine more than one idea with another. I always want to convey love and soul and a little magical something. I loved creating this gift bundle and imagining people opening it- and the response above is just what I was hoping for. Yay!